Children of this age really have such a natural curiosity and response to music, especially before the age of 8. 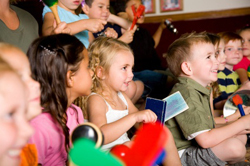 “Tunes and Tales” was created to enable students to tap into their natural instincts and allow them to compose and perform their own music, in addition to having the unique opportunity to collaborate with critically-acclaimed professional musicians. When the students “compose” in our workshops, it’s not with paper and pencil (at least not right away)– it’s with the voices they are given and the rhythms they can make with their bodies. When asked, “what should it sound like when Big Al saves the fish?”, they immediately sing it as if they just heard it in a movie soundtrack. String a few of their great ideas together and ta-da! – you have a piece of music. Only after that do we start talking about what instruments should play which part, and how they should accompany the melodies they have written on their percussion instruments. Students can also keep journals where they draw the natural shapes their melodies have, a perfectly age-appropriate way to prepare them for learning and writing actual notes on a staff later on. To request sample materials, please click here. An excerpt from Day 1 of a 7 visit residency in a 1st grade classroom where they compose music inspired by a particular book in their curriculum. The residency culminates with a performance of their music with narration, while they play alongside the ensemble with percussion instruments.